The Keauhou Farmers Market has been active for almost 4 years and has a list of impressive vendors on its roster. Located in the parking lot of the Keauhou Shopping Center in south Kailua-Kona on the leeward side of the island, it has become popular with not only locals but many tourists who stay at the two large resort hotels nearby. 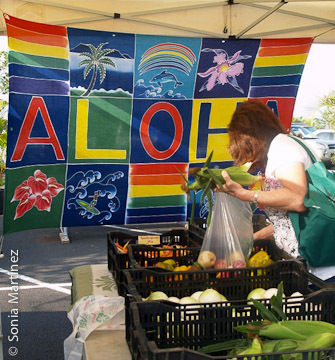 Sponsored by the Kona County Farm Bureau, the market has strict rules about the origins of the farm produce and products sold, and stresses that value-added products must contain a large percentage of locally grown ingredients. The wares are colorful, the vendors were all friendly, and at least the ones I spoke with loved to talk story and answer questions. The ambiance was welcoming and upbeat, and the live music added to the festive sense of community. Kanalani Ohana Farm sells organically certified fruits and vegetables. 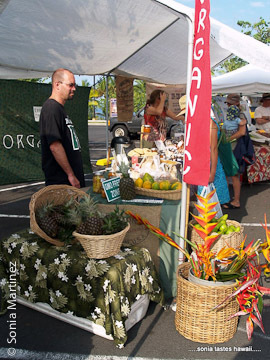 Kanalani Ohana Farm has been at this market since the very beginning. Owned by Colehour and Melanie Bondera, this HOFA certified organic farm at 1,600 feet elevation has been in business for 10 years and is located in Honaunau in an area that contains extremely stony, silty clay loam, which the Bonderas continually improve by the use of permaculture practices. The list of their perennials, fruits, vegetables and other products is extensive and includes avocados, bamboo, bananas, herbs, three different types of spinach, pineapples, sugarcane, papaya, taro, bagged mixed salad greens, homemade breads, muffins, scones, and honey. Their best selling items seem to be jams and 100% Kona coffee. When asked about their vendor experience at the Keauhou location they said they waited until there was a market that would relate to the local area and be visitor friendly. They like the direct interaction between farmers and consumers and would like to see more education for customers on how to use and prepare the locally grown produce. 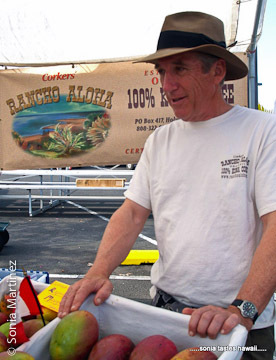 Bruce Corker at the Rancho Aloha stall. Bruce and Lisa Corker are no strangers to the limelight. Their Rancho Aloha HOFA certified organic coffee has received several national awards in coffee cupping competitions even though they only have been growing coffee for the last 9 years. Many years ago they lived in coffee country in Columbia. That experience spurred their dreams of owning a coffee farm of their own in Hawai’i. They have found that the location of their farm at between 1,250 and 1,450 feet elevation in Holualoa was the perfect place for growing their coffee. In addition, they produce Sharwil avocadoes and citrus, as well as lulo (naranjilla) which is fast becoming the "new Kiwi fruit" with local chefs. Although they have been participating at this market only for the last 3 years, they enjoy the mix of local and visitor clientele, but suggest that permitting locally farm-made crafts might improve visitor traffic. Earth Matters sells a wide range of vegetables. Greg and Gail Smith have been farming for close to twenty years, but it is only in the last two and half years that their Earth Matters Farm & CSA has been a constant presence at this market. The organic farm is located in Ocean View in Ka’u at 2,200 feet elevation. Their location was mostly lava but they have been working the land for years to make their own soil. A large and colorful ALOHA pareo banner draws you to their stand which is brimming with lettuces, cilantro, arugula, kale, chard, herbs, edible flowers, plant starts and homemade pesto; best selling items seem to be Baby Romaine, Baby Greens, Rainbow Chard, arugula and cilantro. Cacao pods ready for processing. Kona Origins Chocolate is a fairly new company owned by an enterprising young couple. Vheissu and Carolyn Keffer have been in business and selling at this market for only five months, but they started growing cacao trees in South Kona two years ago after Carolyn’s mom gave them some cacao trees to experiment with. 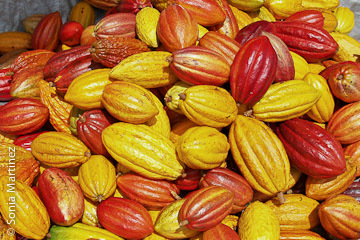 With the help of the Internet providing information, they were able to design a small-scale system to produce chocolate. The soil in their 1,000 ft elevation farm is a combination of loam, sand and lava and although it is not certified organic, they do their best by not using chemicals or pesticides and using organic fertilizers to grow and propagate diversified crops on their farm along with cacao. The Keffers harvest and process the cacao by hand turning it into cacao nibs and chocolate. The dark chocolate bar is their best selling item. I tried a sample of chocolate mochi made by Carolyn that was delicious! Carolyn comments that the other vendors are great, and she thinks they are the hardest working people selling the best food on this side of the island. 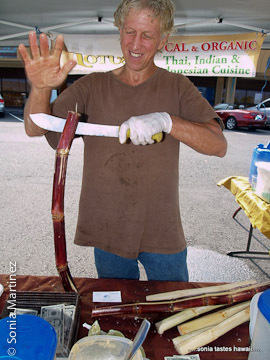 Howie Simon prepares sugarcane for juicing. One of the most colorful characters at the market is Howie Simon. The first thing that drew me to his tent was the sugarcane juicing machine. I grew up in Cuba; where sugarcane juice is called "guarapo" and could be found freshly made in almost every other city block for pennies per cold glass. Besides the freshly squeezed sugarcane juice with lime, Howie was doing a brisk business selling snacks of summer rolls. Although Howie has been manning the booth at the market for the last eighteen months, he and his wife Ladda Simon have mainly been running the Lotus Café for the past four years. Located in the Kaloko new industrial area of Kona, the gourmet restaurant features a unique combination of Thai, Indonesian, Burmese and Indian cuisines. The Simons grow organically as much of the fresh food needed for the restaurant at their home farm and what they can’t grow they buy from other organic area farmers. All of their sauces and curries are homemade with fresh ingredients. The Lotus Café also offers cooking classes at their restaurant location and that was like waving a big red flag at me. I will definitely be attending classes! Type of Market: Local farm produce and products, value-added from the produce or grown from the earth. Food vendors use local products as much as possible. How Funded: The Kona County Farm Bureau is a non-profit organization. Vendors do pay a small fee. a. Range of products: 100% Kona Coffee, mac nuts, eggs, greens, herbs, fruits, vegetables, potted orchids, coconut candy, honey, cacao/chocolate, local fresh fish, beef, veal and much more! b. Growing methods: 20% organic, 10% certified, 25% no spray. c. Best selling products: Greens, fruits, vegetables, eggs, 100% Kona Coffee, macadamia nuts, orchids, fresh fish. Food crops in short supply: Always the seasonal; rambutan, lychee, mangos, mangosteen, Kona limes, Meyer lemons. Most people think because we are in Hawai’i things grow year-round. This is not true. We still have seasons. Other special features: Live music – there were two different groups who performed during my visit – an hour each with about 10 minutes in between.